While revenues for health insurance organizations increased by over 9 percent annually since 2013, the salaries of Chief Executive Officers at health insurance organizations went up an average of 3.6 percent annually; this is just slightly more than the typical merit budget of 3 percent. With the hyperbolic escalation of health insurance premiums, those who purchase insurance (both companies and individuals) are highly concerned about the administrative costs of health insurance companies. Executive compensation is front and center of the scrutiny. 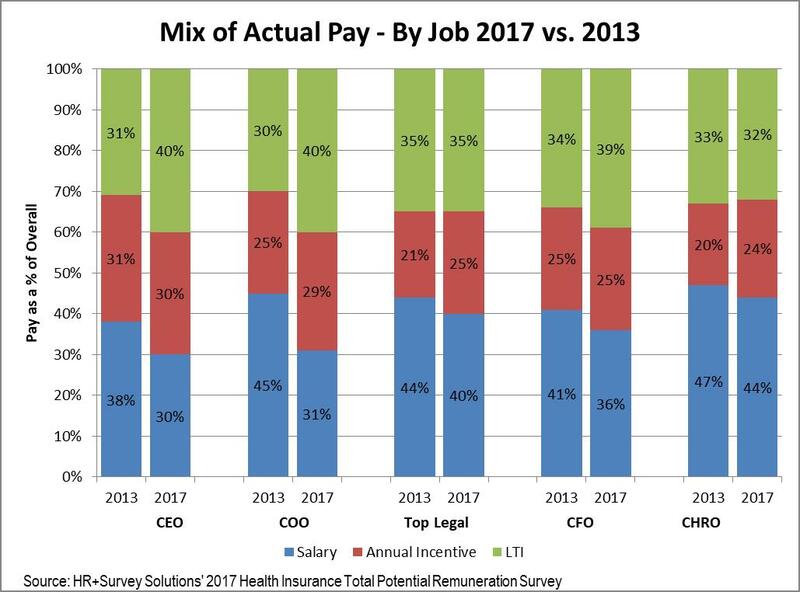 So how has pay changed for the corporate leaders of health insurance companies since 2013 (the first year of implementation of the Affordable Care Act – also known as Obama Care)? Insurance premiums are increasing faster than salaries for most Americans, but is this also the case for corporate leaders? The salaries of Chief Executive Officers at health insurance organizations went up an average of 3.6 percent annually since 2013; this is just slightly more than the typical merit budget of 3 percent. Total cash (salary plus annual bonus) levels for these CEOs increased at an annualized rate of 6.1 percent. Actual Total Direct Compensation (salary + annual bonus earned + payments of long-term bonuses) increased by an average annualized rate of 10 percent according to a recent study by HR+Survey Solutions (http://www.hrssllc.com), a specialty compensation consulting and research firm. One of the reasons that salaries for CEOs have not increased as much as total direct compensation is because their “mix of pay” has changed over the last four years. 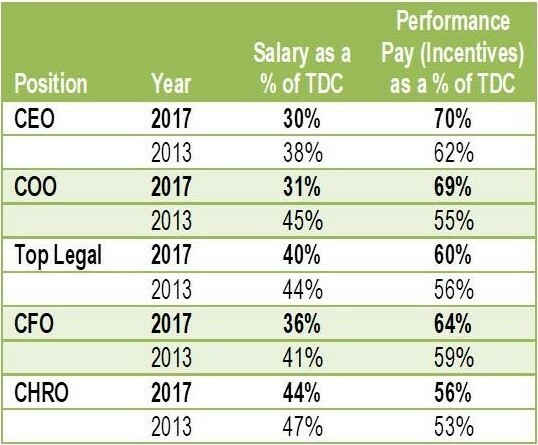 Mix of pay refers to the percent of total direct compensation (TDC) for each of the following elements of pay: salary, annual incentives and long-term incentives. In 2013 salary was a larger component of pay than it was in 2017. Thus, in 2017, a greater percentage of the top executive’s pay package was comprised of performance based pay – which is only earned if certain performance goals are met. Table 1 and Chart 1 illustrate this trend. Mix of pay also varies by company size, as shown in Chart 2 below. Companies with greater than $3 billion in revenues tend to have a greater percent of pay as incentives versus those that are less than $3 billion in revenues. The other way to look at pay is to compare it to revenues generated. On average, companies generated $1,760 in revenues for every dollar of CEO total direct compensation. This has remained largely unchanged in the last four years. However, the organizations that are greater than $3 billion in revenue earned more in revenues per dollar of CEO pay than those organizations that are less than $3 billion in revenue, 90 percent more, as shown in Table 3. This is suggests that the cost of top executive talent has a threshold, so smaller companies need to pay at least a minimum amount for top talent. 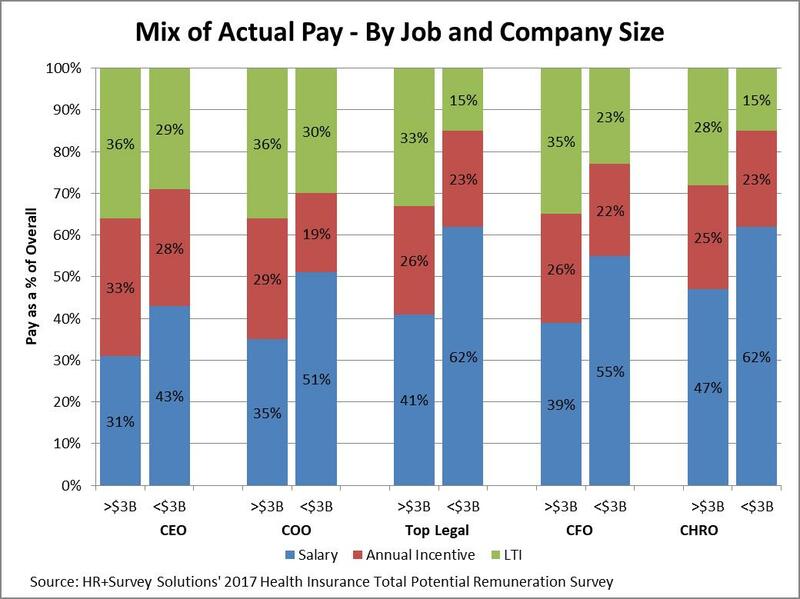 These findings are based on the twelfth annual Executive Total Potential Remuneration (TPR) Compensation, Benefits and Perquisites Survey which assessed pay for the CEO and other executive and management positions at 17 Health Insurance organizations. “The regional health insurance organizations are continuing to increase their use of performance based pay for their executives” says Judy Canavan, managing partner, HR+Survey Solutions. “Because most regional health insurance organizations are often not-for-profit or mutual companies, their strategic focus is on providing valuable products for their policy holders and creating and maintaining a strong provider network; these goals are embedded in their incentive plans,” explains Canavan. All participants in the study utilize an annual incentive plan for their executives and managers. Target annual incentives have increased from an average of 79 percent to 89 percent, for the CEO position. The vast majority of the study participants (82 percent) have a long term incentive plan. Most CEOs and other top executives have other elements of pay such as Supplemental Executive Retirement Plans (SERPs); change of control payouts, if triggered; and severance agreements with payouts, if triggered. The 12th annual Total Potential Remuneration Survey (TPR Survey) was published by HR+Survey Solutions in August, 2017. A total of 17 Health Insurance organizations participated, with 44 executive and management positions covered. The TPR Survey assesses compensation packages including salary, benefits, executive perks, long and short-term incentives, SERPs, and severance agreements, among other values. If you are interested in participating in the 2018 Total Potential Remuneration Survey, contact Judy Canavan at 866-252-6788 x902 [jcanavan@hrssllc.com].